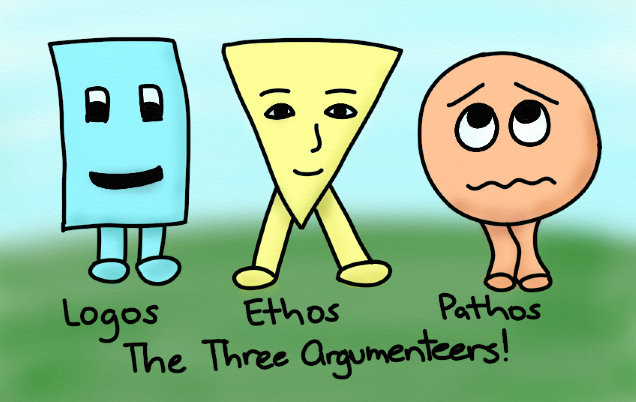 Logos, ethos, and pathos. =) W- and I would like to help J-, her friends, and other people learn more about critical thinking, rhetoric, argument, and eventually negotiation. Someday I may even make a kid’s book about arguments so that kids (and grown-ups!) can get better at recognizing, identifying, and responding to arguments. First step: pick up more practice ourselves. So I’m going to try reading the opinion pages of the New York Times and other news sources and analyzing the arguments there. First up: Teaching to the Text Message, Andy Seslsberg, March 19, 2011. Argument: Short, Internet-focused writing assignments may be more effective than long writing assignments early in the college curriculum. 1. Long assignments don’t work. 1.2 Support: Students’ long writing assignments are of low quality (“font-size manipulation, plagiarism, cliches”). 1.3 Implied: Teachers don’t have the time to check long writing assignments in depth. 2. Implied: Short Internet-focused writing assignments will be more interesting and more useful. 2.1 Support: Alternative formats get people interested. 2.2 Support: Real-life contexts for communication such as networking e-mails, tweets, or comments will be more relevant to students than essays or book reports. 2.3 Support: Alternative assignments are more like students’ everyday life. 2.4 Support: Writing concisely is useful and more in tune with the world’s needs. 3. Support: Short assignments can help students develop better skills and teachers give better feedback. 3.1. Support: Short assignments force clarity and reduce waste. 3.4 Support: Moderation – colleges can still have long writing assignments later in the curriculum.